Terragen is a 3D landscape generating and rendering program capable of producing nearly photorealistic images. It uses fractals and other mathematical procedures to create terrain altitude data, textures, clouds, waves, etc. In addition, it simulates the effect of atmosphere. 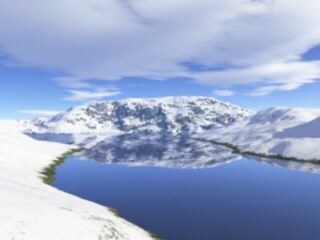 At current stage of development, Terragen (v0.9) is freeware. There is a registered version available with some additional features and option for higher resolution. Commercial version (TG2) is under development. There is a free Technology Preview of TG2 available at Planetside. Terrasource - Links to tutorials, resources, plugins etc.